This infused water book was created to help you drink more water and lose weight! You hear all the time, for weight loss and better health you need to drink more water. But what do you do if you don’t like the taste of water, and what if you’re addicted to sugary or chemical filled diet drinks? This cookbook is filled with delicious drinks to help you break your soda and sugary drink addictions with naturally sweetened drinks. I’ve had such an outpouring of support for my fruit infused drinks that I decided to create an entire book of them. From metabolism boosting and fat burning workout drinks, to homemade sodas, flavored ice cubes and homemade teas this book has something for everyone! 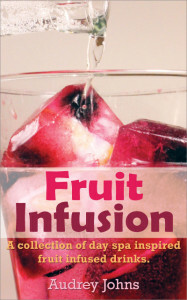 What are people saying about Fruit Infusions? I wanted to write a book without any fancy ingredients, something for everyone no matter their ability to get exotic fruits or not. This cookbook is a huge collection of delicious waters that you can make anytime your sweet tooth strikes you. 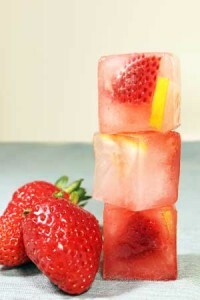 My favorite recipes are the fantastic Strawberry Lemonade Ice Cubes and the Fat Burning Grapefruit Peach workout water. What will yours be? 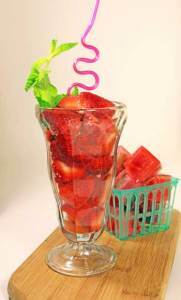 Try out recipes like Strawberry Mint Soda and Strawberry Mint ice cubes. 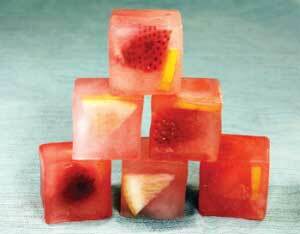 Strawberry Lemonade Ice Cubes turn any boring glass of water into a delicious treat! This Berry Blast is supercharged with Metabolism Boosting and Fat burning ingredients to help you lose weight faster. 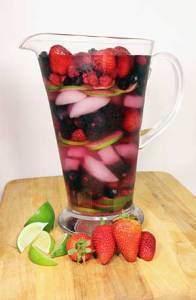 Check out more Metabolism Boosting drinks, including flavored Ice Cubes, Teas and Sodas all meant to help you drink more water and lose weight in my infused water book FRUIT INFUSION: A Collection of Day Spa Inspired, Fruit Infused Waters. Thank you for your creativity; I love this so much. There sure is! Visit Lose Weight By Eating and look in the menu bar for “Weight Loss Plan” It’s FREE!